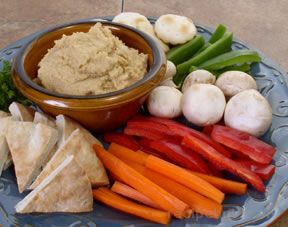 A classic Middle Eastern vegetarian appetizer, hummus makes a great dip for vegetables or a tasty spread for pita bread. Place first three ingredients in a food processor and pulse until smooth. Add the tahini, water, salt, cumin, and cayenne pepper to the bean mixture and pulse until smooth. Refrigerate to marinate the flavors. It can be held in the refrigerator for up to one week. Before serving, bring to room temperature, drizzle with olive oil, and sprinkle with paprika and freshly minced parsley. Serve with fresh vegetables, pita wedges, or crackers. Note: If you do not have tahini, smooth peanut butter can be substituted.